The Folligraft 3.1 Hair Replication technique allows for real human hair that is first hand picked to match your growing hair in color, texture, sheen and wave or curl, then inserted into a liquid skin membrane in a direction that is geometrically matched to your growing hair. The Folligraft 3.1 membrane resembles a layer of skin: it is porous, so it breathes like skin; it is transparent, so it takes on the color of the individuals own skin. Before the graft application occurs, the skin of the scalp is thoroughly exfoliated of dead skin cells, expediting a naturally-occurring process. The grafting procedure itself is non-invasive and is accomplished through a chemically induced ionization process. All materials have been specially formulated of medical grade and are FDA and/or EU approved for contact with human skin. Call 1 (877) 665-4247 for a FREE Consultation on Long Island or Contact Us Online Today! Folligraft 3.1 is the single most significant development in hair loss replacement in decades. HRC is proud to offer this affordable and pain-free alternative to hair transplants for both men and women of all ages. Folligraft 3.1 is a choice that "splits the difference" between surgery and conventional hair loss replacement. Unlike surgical techniques, Folligraft 3.1 requires no "donor" area, nor is its success dependent upon the availability, texture and curl pattern of donor hair. The Folligraft 3.1 procedure can be used to provide additional hair to those who've already undergone hair loss replacement surgery but want greater density. In fact, over 75% of our clients had transplant surgery prior to coming to HRC for our procedure. Some have spent in excess of $50,000.00 before giving up on surgery. Folligraft 3.1's capability to replace hair in any area of the scalp, and recreate a frontal hairline, makes it ideal for sufferers of male and female pattern baldness, alopecia, chemotherapy patients, and burn and scar victims. Folligraft 3.1 is the non-invasive hair graft - surgery is not required to fulfill its hair replenishing properties. Folligraft 3.1 results in a demonstrable increase in cosmetically significant hair, unlike chemicals that produce insignificant velo hair (short, non-pigmented "peach fuzz"). The results of the Folligraft 3.1 procedure are guaranteed - there is no waiting period to see if it will actually work. Folligraft 3.1 looks, feels, and acts like real growing hair because it is real human hair. 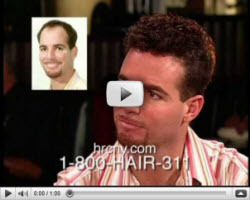 Hair Replacement Center would like to share some of our client testimonials with you. Our staff is here to help you look your best and will be by your side each step of the way. Get answers to commonly asked questions about hair loss restoration. See hair loss restoration photos and imagine what you could look like with your hair back! A member of the Natural Image Hair Group. Providing "Hair Loss" solutions on Long Island for over 30 years. Long Island SEO | NewSunSEO, Inc.